Dogs have two different sets of teeth, just like people do. Each set is designed to serve their needs at different ages. In fact, you can even use your dog's teeth as a way of telling their approximate age. The first set of puppy teeth are called deciduous teeth, but they are often referred to as milk teeth because they erupt through the gums while pups are still nursing. These teeth are quite tiny and sharp, and they have a very small root that makes them easier to shed around four months of age when the permanent adult teeth begin to replace them. The first set of 28 milk teeth does not contain molars because pups do not need them at this point. Adult teeth are much larger, and they have strong roots meant to hold the teeth securely for the rest of the dog's life. The number of teeth in a dog's mouth jumps to 42 by the time a dog is finished teething around six months old. A canine's teeth can be broken down into four specific groups. Each group has a distinct purpose. The incisors are the small teeth in the front of the jaw that are used for scraping meat remnants from bones and picking up items. A dog also uses these teeth to nibble at himself during grooming as he tries to remove fleas and other irritants. There are a total of twelve incisors; six in the upper jaw and six in the lower jaw. These pointy teeth are commonly referred to as fangs and are used to bite and hold on to whatever a dog seeks to keep, be it a bone, a toy or another animal. Dogs have four canines; there are two on the upper jaw and two on the lower jaw. Each individual pair is separated by a set of incisors. The premolars are in charge of all the major chewing. You'll notice that when you give your dog a toy or large chew treat, he'll take the item from you with his incisors and fangs and then transfer it to the side of his mouth when he begins chewing. In the wild, dogs use their premolars to rip meat from the bone. There are sixteen premolars; four each on either side of the upper and lower jaws, just behind the canines. Molars handle the heavy duty work of a dog's teeth, breaking down larger hard items like bones, large kibble or dog biscuits. Every adult dog has ten molars just behind the premolars; two on each side of the top jaw and three on each side of the lower jaw. 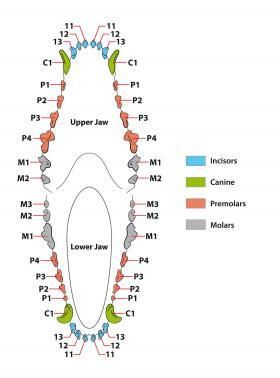 The dog teeth chart pictured here shows the layout of the four specific teeth groupings in a dog's mouth. A dog's teeth anatomy is described with the first letter indicating the type of tooth and the number following indicating its position in the dog's mouth. Veterinarians use this method of describing the teeth for creating a detailed medical history in your dog's medical records. It also helps them assess the level of dental disease your dog may be suffering from. Dog teeth are not prone to decay, but dogs are prone to gum disease if their teeth are not kept clean. Gum disease is a significant problem affecting dog teeth. Most dogs receive adequate tooth cleaning from chewing kibble, bones and biscuits that scrape away tartar from the gum line. However, dogs that receive a softer diet, such as canned dog food, will need to have their teeth brushed just as you would do for a small child. However, this is easier said than done. Most dogs require some training and practice before they will let someone brush their teeth. However, most will become accustomed to it eventually if you brush their teeth on a regular basis. It's best to start the procedure during puppyhood since puppies are easier to control. According to Pet Lifestyle Advisor Wendy Nan Rees, "The first thing you need to do is get your pet used to letting you put your finger in his mouth. Dip your finger in a little peanut butter, and once your dog has licked it off, take the opportunity to run your finger around the inside of his mouth. This will gradually accustom him to the basic procedure. Once your dog accepts your finger, you can progress to wrapping it in a thin layer of gauze before you begin his gum massage. This will also remove some food and debris, so you're already moving in the right direction." Once you've accustomed your dog to your gauze-wrapped finger, you can move on to using a doggie toothbrush. According to Rees, "Generally speaking, the smallest, least invasive brush style will be the easiest for converting your dog." It's usually best to use a medium-bristle toothbrush on a dog. You can simply brush the teeth with plain water; Rees advises against using human toothpaste. "Human toothpaste can upset your dog's tummy, and most dogs don't like the taste. Dog toothpaste products come in several tempting flavors." Apply a pea-sized bead of dog toothpaste to the brush, or just wet the brush with plain water. Gently hold your dog's mouth open just wide enough to insert the toothbrush. Begin brushing along the gum line back near the molars. Work your way forward to the incisors. Rinse your brush in water frequently as you go. Dogs with serious tartar and calculus build up will require a cleaning by a veterinary dentist who will use a dental pick to scrape away the build-up and polish the tooth surface so bacteria have less of a foothold in the future. Wendy Nan Rees offers one final piece of advice that all dog owners would be wise to heed. "Make sure that you never make brushing your dog's teeth a chore. This should be a fun and bonding experience for the two of you." According to a study conducted by Purdue University, there's a connection between gum disease and heart disease in dogs. When tartar is allowed to form on a dog's gum line, it makes a home for anaerobic bacteria that multiply and work their way into the pockets around the roots of a dog's teeth. These pockets grow larger, and the teeth eventually fall out. The bacteria now has a route directly into the bloodstream where it collects in the dog's heart organ and builds up just like plaque in an unhealthy human heart. Left unchecked, the dog develops heart disease and will eventually die. In addition to gum disease, a dog's teeth can also fall out due to some type of physical trauma. Teeth may also never form properly and never develop where they should in the first place. Understanding how a dog's teeth are formed and their correct anatomy helps you to better care for their teeth. Dog owners often don't think about a dog's teeth but if they are not properly brushed and kept free of gum disease, your dog could suffer serious health problems. 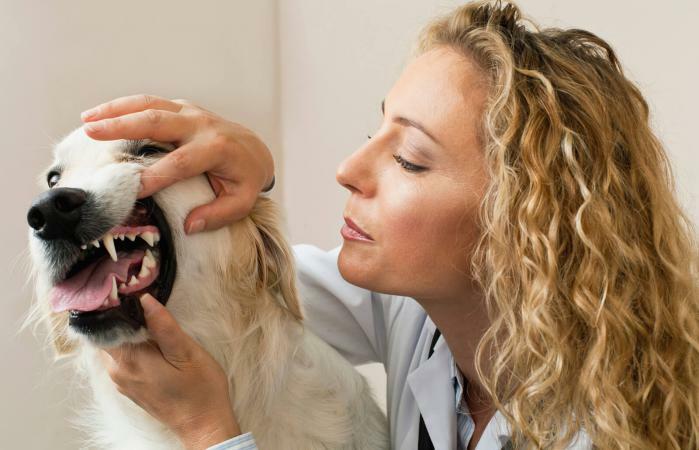 Always follow your veterinarian's advice on proper dog dental care and gum health.